Wish you could be hobnobbin' with the Hobgoblin? Well, now you can, with this 12-inch scale resin statue of one of Spider-Man's greatest foes! Whether you're a fan of the Ned Leeds, Jason Macendale or Roderick Kingsley versions of the character, this is the ultimate Hobgoblin collectible! 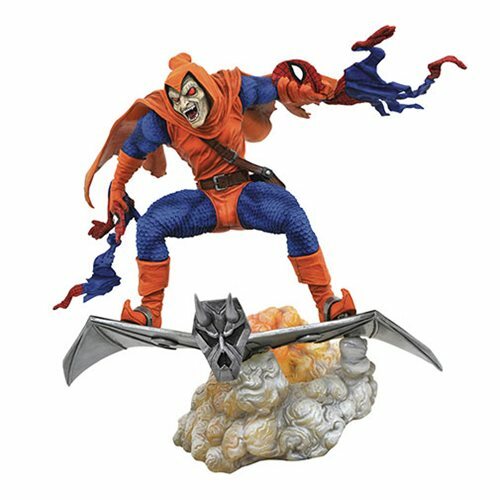 The Spider-Man Marvel Comic Premier Collection Hobgoblin Resin Statue is a limited edition of only 3,000 pieces. The statue was sculpted by Jean St. Jean from a design by Joe Allard, and comes packaged with a certificate of authenticity in a numbered, full-color box.